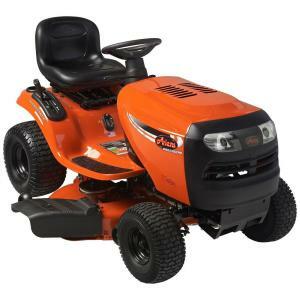 This is the worst riding mower ever built. With only 100 hours on this machine and just barely out of warranty, I have had to repair and finally modify the blade arbors to keep them from breaking. Finally, after resolving the deck issue after several hundred dollar, the engine blew up. There has to be something wrong with this mower. I used the mower once and then changed the oil as recommended by the store. I used it a second time and the motor started cutting out. The third time I used it I had only been mowing for about 20 minutes and the engine cut out and stopped. I could not get it to restart. The store started telling me some repairs I could do to it and I told them when I pay this much money for a BRAND NEW tractor I did not expect to have to do any repair work to it besides regular yearly scheduled maintenance. Lucky for me this happened 2 days before my 30-day return policy was up and was able to return it for a full refund and purchase a name brand John Deer riding lawn tractor. After reading a similar story on this site I feel very fortunate I only spent money for a oil change before taking it back. Buyer beware.